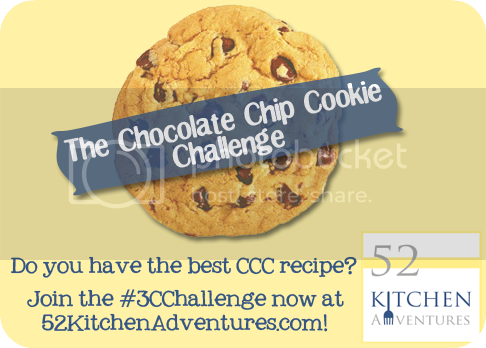 Hi, 52 Kitchen Adventures’ readers! Steph asked me if I would stop by and share my favorite chocolate chip cookie recipe with you. Since I am a cupcake blogger, of course my chocolate chip cookies needed to be in cupcake form! I baked chocolate chip cookie cupcakes, topped them with cookie dough frosting, and topped the whole thing with a chocolate chip cookie. This is the dessert for the extreme chocolate chip cookie fan! I don’t actually have a favorite chocolate cookie recipe, but I recently fell in love with the chocolate chip cookies my friend Brooke (famous for her customized wooden utensils) made for her annual crawfish boil. When I asked her for the recipe, she revealed that she didn’t use a chocolate chip cookie recipe. Huh? She used Paula Deen’s praline cookie recipe, but she added chocolate chips and browned the butter. Like me, unless you are told, you likely wouldn’t be able to identify that the cookies contain praline (ground candied pecans). However, their nutty caramel crunch adds a complexity to the cookies that – especially when combined with the richness of browned butter – makes the praline well worth the effort. While I used Paula Deen’s recipe for my chocolate chip cookie cupcakes, you can use whatever recipe you like. If you want to use a different recipe, just fill the cupcake liners almost to the top with your cookie dough and reserve enough cookie dough to make small cookies to top the cupcakes. On Cupcake Project, I have a post devoted to creating cookie dough frosting from any cookie dough recipe. You can use that post to create cookie dough frosting from your favorite chocolate chip cookie dough, or just use the frosting recipe below. As noted above, this recipe uses Paula Deen’s praline cookie recipe as a starting point. 1. In a small saucepan on medium heat, heat sugar and water, stirring constantly. 2. Remove from the heat when the sugar/water mixture begins to boil (about 3 minutes). plastic bag and use a rolling pin to crush them. 2. Melt butter over medium heat in a small skillet or heavy-bottomed pot. 3. Continue to heat the butter, stirring periodically, until it turns brown (10-15 minutes). smaller and the whole thing will look more brown (that’s when it’s done). 4. Remove butter from heat and cool to room temperature. 6. Mix in the eggs. 7. Mix in the vanilla, flour, and baking soda. 8. Fold in the chocolate chips and praline. 9. Fill 12 cupcake liners almost to the top with cookie dough. 11. Bake cupcakes for 18 minutes or until tops just begin to get dark brown. 12. Bake cookies for 13 minutes or until edges just begin to get dark brown. 1. Melt butter over medium-heat in a small skillet or heavy-bottomed pot. 2. Continue to heat the butter, stirring periodically, until it turns brown (10-15 minutes). The butter will first boil with big bubbles (it’s not done then). Then, the bubbles will get smaller and the whole thing will look more brown (that’s when it’s done). 3. Remove butter from heat and cool to room temperature. 4. Mix brown sugar, granulated sugar, vanilla extract, and all-purpose flour with cooled brown butter. 5. Mix in milk a little bit at a time until frosting is your preferred consistency..
6. Spread or pipe on cooled cupcakes. 7. Top with a cooled cookie. Okay, how fun are these?!! Cookies AND cupcakes in one? Awesome! @Kristy – Stef outdid herself! These looks so amazing, I can’t wait to make them. @Dawn – that’s exactly what I’m thinking! AMAZING, thank you for sharing!!! Mommyof2Girlz/StephD recently posted Sew Fierce Boutique Anniversary Giveaway!!! @Steph D – Stef did a great job – I can’t wait to make these! Is the cupcake part just a differently shaped cookie or does it turn out at all like a cupcake? Looks delicious! @Julie – it sounds like a cookie shaped like a cupcake, but Stef will know better than I. She blogged about these too, and if you leave a comment on his post, I’m sure she will let you know. I’m making these right now. The frosting seems so strange to me (direction reading only). I can’t imagine what it will taste like using flour. I’m sure amazing because Steph always does amazing things. @Dee – I’ve made frosting with flour before and couldn’t taste it. I can’t wait to hear what you think of these CCC cupcakes – they sound amazing! I just attempted the frosting using Earths Balance soy free butter and Almond milk. Turned out great! The icing tasted like flour, looked like bread dough and my granddaughter was playing with it as if it were Play Doh! What’s not to love about this?! Cupcakes and cookies together–amazing!